Arrow Scientific introduces the Bottom Line Depositor, a laboratory candy depositor that can deliver centre-filled products in batches as small as 500g. The Bottom Line Depositors feature a custom single shot depositor suitable for heat sensitive and viscous products. The Bottom Line Depositors food processing equipment can be used to produce candy product concepts such as filled chocolates, hard candies and caramels. It can also be extended to honey-filled throat drops, yoghurt filled fruit jellies or sugar-free hard candy filled with energy gel. 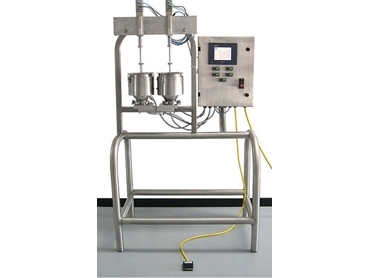 The Bottom Line Depositors feature two (or more) individually heated and temperature controlled product hoppers and pump heads, which are individually servo operated. The hoppers can hold up to 3kg with optional heat control, custom die plates and special piece sizes. The Bottom Line Depositors food processing equipment, available from Arrow Scientific, also includes automated features such as a touch screen interface that can store up to 99 recipes.